The everyday little things that make our life perfect. Over the past few months, Joni and I have felt the Lord's calling to tell my story to any and all who will listen. In order to do that best, I have resigned my position as worship minister from Plymouth Park Church of Christ. We feel that this ministry is so important, we must pursue it at all costs...even giving up something we love. We will be attending Richland Hills Church of Christ when not out of town, and are excited to be re-joining our family and friends there. We are headed to the doctor today for a check-up for Hannah. Joni and I are curious to see how big she is on the growth chart! She's outgrown most of her 0-3 month clothes, and she's turning 3 months in about a week! We'll be in Odessa, TX this weekend for my niece's HS graduation and to give our "All He Needs" presentation on Sunday morning at the New Life Church. It will be a busy weekend as we'll then head on to Lubbock to visit Joni's family. Joni has a great-grandmother who is 95 years old. Joni's mom, and grandmother are going to be there, and we are going to get a rare 5-generations picture...wow! 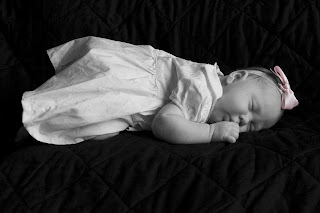 A few weeks ago, one of our friends came to our house to take pictures of Hannah. We absolutely love how Kipi was able to capture Hannah's personality and the joy of our family. You can see a few more pictures by going to Kipi's website. Hannah has her own featured gallery. In our travel company, we describe Neverland as the place where you can escape, recharge, and find peace. For us, Neverland is everywhere from our dining room table to walking down Main Street U.S.A. It is worshiping together at our church and spending time with friends and family. Neverland is anywhere we can be as a family, sharing our faith, and making new memories together. ©McDoniel Family. Simple theme. Powered by Blogger.